See the various sides to Bangkok on a bike tour that takes you from food markets to skyscrapers, giving you several perspectives on this vibrant city. 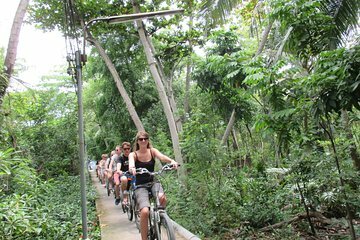 Witness the daily life of local residents, enjoy a tasting of tropical fruit, cross the Chao Phraya river by boat, cycle past farms, watch for lizards and turtles, and enjoy a freshly prepared lunch. A lovely experience with a great guide, Tom, and a fun tour of Bangachao, little Chinatown, and other Bangkok sites. I'd highly recommend this tour and this company. Thank you!